Friday, November 14, 2008 Labels: eateries. It is a universal truth that a bleary morning's avant-garde fashion statement is the afternoon's sartorial question mark. Note to coworkers: "Ooh! Look at you!" does not a compliment make. Particularly when accompanied by a look of confusion usually reserved for listening to Sarah Palin try to explain the military-industrial complex. That what-the-hell-am-I-wearing epiphany, brought on by an angry encounter with the ladies' room full-length mirror, was only one in a long line of startling realizations yesterday. Sometimes there's so much lesson-learning in my life that I fear I'm part of some elaborate hidden-camera after-school special. "This week, on 'K Falls Down': K discovers that the disquieting tingling in her extremities is directly linked to her tights cutting off blood circulation." So what's a self-pitying sausage to do? If you've been dutifully graphing my moods and culinary proclivities, you'll find a crowded square at the intersection of Cranky and Mexican Food (although frankly, a disturbing number of roads in my life lead to Mexican food). We received our menus, at which point I was disappointed to find everything spelled correctly, and therefore not spirits-lifting. 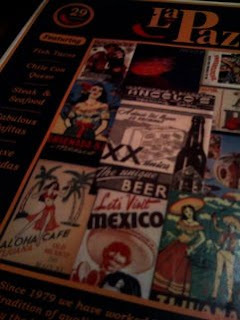 The menu at La Paz has changed a lot since the last time I was there, and not necessarily for the better. 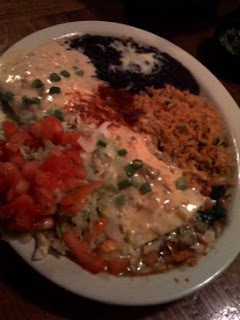 It used to be that La Paz was the place to go for flavor combinations you couldn't find anywhere else. Now the options are truncated and the platings are far less inspired. White plate, white tortillas, lettuce topped with peaked tomatoes, zzzzzzzzzzzzzzzzzzz. The kitchen is a little stingy with the chips, too, though the red and blue versions in the mix are a nice touch. They're delicately salted and not greasy, but they look a little like they ran through a rock tumbler before they got to the table. 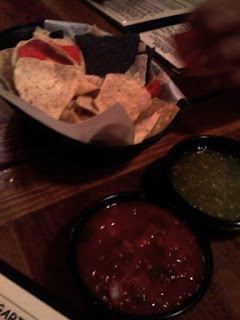 With the jagged crumbs you can choose between a red salsa (OK, but a little too sweet) and green (tastier, but the consistency of water, which makes dipping a Sisyphean effort). 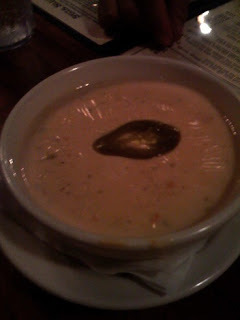 MJ ordered the cheese dip, which is inexplicably trough-size. Seriously, you can wash your feet in this bowl. It's nicely spicy and chunky with onions, but it created a rather Alice in Wonderland–like table with all the confusion in scale—tiny dental cups of salsa and handfuls of chips next to a vat of melted cheese (downside: the queso came out with a skin on it, which was less than appetizing and seems like a pretty simple fix). 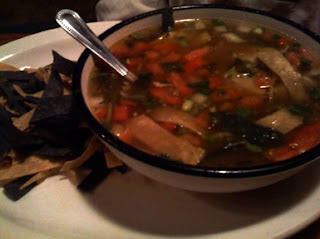 LSis ordered the tortilla soup, a meaty broth swimming with avocado and studded with white-meat chicken and tomatoes. She proclaimed it good but also "super salty" (I believe that was prefaced with the prediction that it would give me an immediate coronary event) and she noted skeptically that the chicken tasted peculiarly "gamey." I don't think it knocked her pants off (that's right. What good is having your socks off? ), because I caught her eyeing my plate. I ordered the burrito gordo. Memo to Mexican restaurants: I'm sure that word has another connotation, one that implies that you're getting a lot of really great stuff, but I do not like having to request a dish that has the word "fat" in it. You can have the more-to-love burrito with chicken, beef, or spinach, rolled inside a flour tortilla with guacamole, pinto beans, and sour cream. I chose the spinach, natch. When it arrived at the table, I was pleasantly surprised to see the pretty presentation, but less thrilled to find the tortilla smothered in extraneous cheese dip. NOT NECESSARY. I just ate a bucket of the stuff; my arteries can't take anymore. Really, though, isn't that pretty? 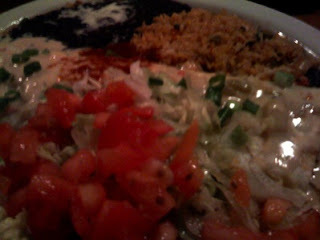 It's an enormous portion, accompanied by mundane refried black beans and some confusingly seasoned rice (it came out crunchy, with the distinct whiff of heat lamp about it, and tasted like ... teriyaki?). Still, that's at least two solid meals there, if not three. I doggy-bagged the heck out of it. The service was cheerful and relaxed, if lacking a little something in the pacing. When the plates are the size of planets, you probably want to give people the opportunity to take breaks between bites before you pounce on them with the check. LSis was delighted to discover that her first wimpy glass of Chardonnay seemed to only get more full as the night went on. MJ was bouncily giddy to hear the decidedly early-90s soundtrack overhead. The highlight for me, because I'm not generally a beer drinker, was the crisply chilled and effervescently carbonated draft ale (bonus: thanks to that night's specials, it only cost $2.00). Well that, and I was relieved it was dimly lit. I still have no idea what I was wearing. At least one coworker that I know of kept intending to tell you that you looked great yesterday but is notoriously deficient in the short-term memory department. Yellow is a very pretty color on you.